What Is the Cause of Histoplasmosis? What Are Histoplasmosis Risk Factors? What Are Symptoms and Signs of Histoplasmosis? When Should Someone Seek Medical Care for Histoplasmosis? How Do Health-Care Professionals Diagnose Histoplasmosis? What Are Treatment Options for Histoplasmosis? Are There Home Remedies for Histoplasmosis? What Are Complications of Histoplasmosis? What Is the Prognosis for Histoplasmosis? How Can One Prevent Histoplasmosis? Histoplasmosis is an infection caused by a dimorphic fungus, Histoplasma capsulatum. Risk factors for histoplasmosis include immunocompromised people and association with airborne particles containing the fungi (caves containing bats, bird feces, construction sites). Histoplasmosis is most common in North and Central America. In North America, the fungus is known to live in the soil in the central and eastern states, especially in the areas around the Ohio and Mississippi River Valleys. The fungus is not limited to these areas and can live in other areas of North America. Data on the U.S. geography of this fungus comes from studies performed in the 1940s and 1950s, therefore it is not current. Outside the U.S., histoplasmosis is also found in parts of Central and South America, Africa, Asia, and Australia. Symptoms of histoplasmosis range from none to flu-like symptoms (fever, dry cough, chest discomfort); severe infections may cause vision problems, mouth ulcers, seizures, encephalopathy, and death. Seek medical care if symptoms of the flu or pneumonia persist, especially in people with immunocompromised systems. Histoplasmosis has an incubation period of about three to 17 days. Histoplasmosis is not contagious; it is not transmitted person to person. Definitive diagnosis is made by culturing and identifying Histoplasma capsulatum from biopsy, blood, or sputum samples. The majority of patients infected by Histoplasma capsulatum require no treatment; the small number of patients who develop more severe infection may require long-term antifungal treatments (months to a year) while a few may need lifelong antifungal treatment. Physician specialists who may be consulted if the infection becomes moderate to severe include infectious disease physicians and others, depending on which organs are damaged. Follow-up is important because of the potential need for long-term antifungal treatments to monitor drug levels and to determine effective treatment or reoccurrence of infection. 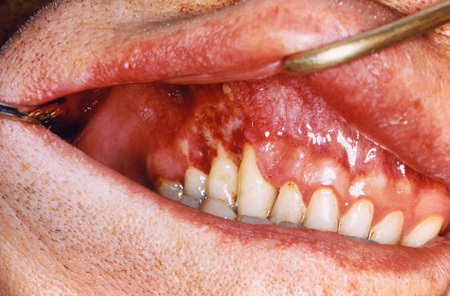 The large majority of patients who develop histoplasmosis have no complication; ocular (eye) problems, mouth ulcers, encephalopathy, seizures, and, rarely, death may occur in those few patients that develop severe disease. The large majority of people who develop histoplasmosis have good outcomes; patients who are immunocompromised have outcomes that range from good to poor, depending on their response to treatment and disease severity. No vaccine is currently available to prevent histoplasmosis; avoidance of bat and bird habitats and avoiding construction sites that may aerosolize the fungi is recommended. Subacute progressive disseminated histoplasmosis causes intestinal, adrenal, cardiac, or central nervous system (CNS) involvement. Acute progressive disseminated histoplasmosis causes encephalopathy (alteration of brain function), meningitis, mass lesions, and cutaneous lesions. See the symptoms and signs section below for additional information about how the disease may cause humans problems. Although anyone who inhales the fungal components (spores, mycelia) may develop histoplasmosis, unless a large number of fungal organisms or repeated exposure to the fungi occurs, symptomatic disease is infrequent in healthy people. However, infants, children, the elderly, and those with chronic lung disease are at risk. Immunosuppressed patients (for example, cancer or AIDS patients) are at the highest risk for severe histoplasmosis. Histoplasma capsulatum lives in acidic, damp environments that contain organic material. High concentrations of the fungus occur in caves where bats or birds reside, and the fungi are in the soil. Bats and birds can become infected and spread the fungi in their feces. Most outbreaks occur when construction or renovation projects disturb and aerosolize dust containing the fungi so people who participate in or live near such projects are at higher risk for histoplasmosis. The majority of infections require no treatment; however, if moderate to severe symptoms develop, such specialists in infectious disease, pulmonology, ophthalmology, neurology, and/or surgery may be consulted. Patients with the symptoms of histoplasmosis (or pneumonia), especially if they have any of the risk factors listed above, should not attempt home care; they should seek medical care urgently. Diagnosis of histoplasmosis is done by obtaining the patient's history and by seeing the fungi in samples taken from infected tissue and examined microscopically. However, the definitive diagnosis of histoplasmosis is done by isolating (growing) the fungus from one or more tissue samples (blood or sputum samples or biopsy samples from skin, bone marrow, liver, or other organs). 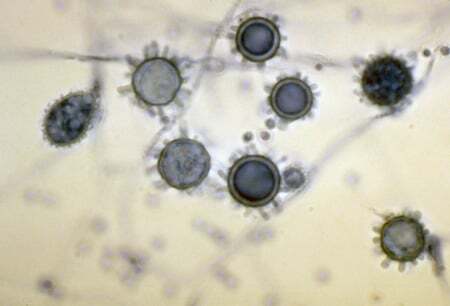 Growth of the fungus differentiates similar diseases from each other (for example, blastomycosis from histoplasmosis). In addition, there are immunology-based tests that can detect fungi antigens produced by Histoplasma that are present in urine. Another available test can detect serum antibodies directed against the fungi; this test indicates the person has been exposed to the fungi but does not determine active infection. For asymptomatic or people with acute localized infection who are otherwise healthy, antifungal treatment is usually not recommended by the Centers for Disease Control and Prevention (CDC) as the infection will resolve on its own in about three weeks. If symptoms persist a month or more, itraconazole (Sporanox), ketoconazole (Nizoral), fluconazole (Diflucan), or amphotericin B may be effective. If central nervous system (CNS) involvement occurs, or if the person is compromised by other diseases or has severe histoplasmosis (progressive disseminated histoplasmosis), either itraconazole or amphotericin B is recommended. The lengths of time, dosing amounts, and dosing routes are individualized for the patient; consultations with both infectious disease and pulmonary specialists are recommended. Treatments may last for many weeks to a year or more. Immunocompromised patients may require lifelong antifungal medication. Other new azole compounds may be effective in some difficult or unresponsive cases; specialists will select the appropriate new drug treatment. Surgery has been used to treat some complications seen in some individuals with histoplasmosis. For example, pericardiocentesis or a pericardial window procedure (both designed to remove fluid that compresses the heart) may be performed in patients who develop pericarditis. Surgery is also used to resect cavitary lung lesions, to excise lymph nodes that compress pulmonary, vascular or other structures, or to replace damaged heart valves or other structures. Because most infections require no treatment, many people attribute home remedies for treating and/or curing the disease. The list of home remedies cited is long and includes garlic oil, tea tree oil, fish oil, green tea, cloves, cat's claw, onion, turmeric and other compounds. Patients, especially those with moderate to severe symptoms of histoplasmosis, should consult their doctor before using these home remedies. Follow-up is important for patients with histoplasmosis because treatment should be regularly given over long terms of time (often six to 12 months), and itraconazole blood levels should be examined to be sure dosage is effective, and patients need to be monitored for symptom resolution or relapses by the doctor. The majority of people infected with H. capsulatum recover completely with no complications. A few people may show small areas of lung scarring on chest X-rays while pleural effusions (fluid around the lung) and pericarditis can develop in about 5% of acute symptomatic patients. Another 5% may develop rheumatologic problems like arthritis or skin disorders such as erythema nodosum or erythema multiforme. Individuals with chronic pulmonary histoplasmosis may develop cavitary lung lesions, pulmonary fibrosis, and dyspnea (shortness of breath). Adrenal gland infections, can occur and be rarely associated with Cushing's syndrome. Others may develop ocular histoplasmosis syndrome where H. capsulatum spreads from the lungs to the retinal blood vessels, which may result in partial blindness. Acute progressive disseminated histoplasmosis patients may develop CNS problems that result in encephalopathy or seizures, adrenal insufficiency, cardiac problems such as valve failure, angina, and poor cardiac output. Acute progressive disseminated histoplasmosis, if not treated quickly and appropriately, can lead to death in a few weeks. Even with lifelong antifungal treatment, about 10%-20% of people with disseminated disease will relapse. About 90% of patients that acquire acute pulmonary histoplasmosis are asymptomatic and about another 5%-7% who develop symptoms recover completely so the prognosis or outcomes are good for the majority of patients. Few may get acute pericarditis and pleural effusions. As the severity of the disease increases, the prognosis worsens from fair to poor. Chronic pulmonary histoplasmosis patients usually develop cavities in the lungs and lung nodules that may calcify. These changes may reduce lung capacity and increase chances for secondary lung infections. Progressive disseminated histoplasmosis has a grim prognosis (death in a few weeks to months) if not appropriately treated. Even with appropriate treatment, some patients will experience relapses and may require antifungal medication for the rest of their life. There is no vaccine to prevent histoplasmosis. The CDC recommends people "avoid areas with accumulations of bird or bat droppings, especially if you have a weakened immune system. Areas with accumulations of bird or bat droppings should be cleaned up by professional companies that specialize in the removal of hazardous waste." For those workers who may need to be in areas with high levels of fungi, the CDC has a book that addresses safety methods titled "Workers at Risk." Every one of us has experienced the wave of chills and exhaustion that a fever causes. Fever usually occurs in response to an infection as with the flu or cold viruses or strep throat bacterial infection, or with inflammation that occurs with tissue injury or disease (such as with some cancers). United States. Centers for Disease Control and Prevention. "Fungal Diseases." Nov. 21, 2015. <http://www.cdc.gov/fungal/diseases/histoplasmosis/index.html>. What symptoms and/or signs did you experience with histoplasmosis?